Please scroll down for Terms of Sale. Product is brand new & sealed. Pantone Fashion Home + Interiors Color Guide & Specifier (FHIP230N) is the new eco-friendly color formula guide from Pantone. This new edition of the Color Specifier & Guide Set presents the existing 2,310 FASHION, HOME + INTERIORS Colors created from new, more Earth-friendly formulations and an accompanying new PANTONE Color Number suffix, TPG (Textile Paper Green). The colorant combinations have been modified to remove all lead pigments and chromium, while maintaining the same color integrity as the previous versions that featured the TPX suffix. Reformulating the colors in this product to make them more eco-friendly has allowed us to meet compliance standards in European countries and other parts of the world. In addition to the eco-friendly formulas, weve made other enhancements to improve the user experience. The guides and specifiers are now available in a two-volume set; making the product easier to handle, utilize and store. Improved construction on the binders makes for much greater durability. A rigid storage sleeve, located inside each Specifier binder, allows you to store your guides safely. Replacement pages for the specifier are available to replenish old pages. Thousands of market-proven Pantone colors on paper for fashion accessories, home furnishings, hard home, leather goods, cosmetics, products, paints and interiors and more. Ideal for non-fabric materials, the PANTONE Color Specifier and PANTONE Color Guide have been redesigned for the ultimate in color selection and control. All 2,310 colors are now arranged in complete chromatic flow that enhances inspiration and speeds production. PANTONE Color Specifier features six tear-out chips of each PANTONE Color, making it ideal for palette development and presentations. Chips attach to sketches and design files for accurate color communication and quality assurance at every stage of product development. PANTONE Color Guide is a handy, take-along guide set perfect for sample shopping, client meetings and on-site reviews. Its your complete, comprehensive color library in a compact format. Rigid sleeves allow for easy storage and retrieval of the Color Guides. Six tear-out chips of each color for palette development, color communication and attaching to design sketches and files. Colors are chromatically arranged and referenced by PANTONE Name and Number. Individual replacement pages are available for Specifier. Includes PANTONE COLOR MANAGER Software download, for digital design with all PANTONE Color libraries. Color numbers feature new TPG suffix. Reformulated colors meet international compliance standards. Colors are numerically referenced and named. Two-volume binder and guide set, with the 210 New Colors displayed in the front of volume one. PANTONE Colors are recognized around the world as the premier color standard. States will be extra based on actual cost. 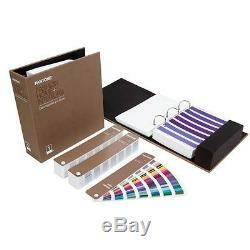 The item "Pantone FHIP230N Color Specifier + Guide Set NEW (TPG)" is in sale since Wednesday, June 21, 2017. This item is in the category "Business & Industrial\Printing & Graphic Arts\Printing & Graphic Essentials\Color Guides & Pantone". The seller is "genesis-technologies" and is located in Austin, Texas. This item can be shipped to United States, Canada, United Kingdom, Denmark, Romania, Slovakia, Bulgaria, Czech republic, Finland, Hungary, Latvia, Lithuania, Malta, Estonia, Australia, Greece, Portugal, Cyprus, Slovenia, Japan, China, Sweden, South Korea, Indonesia, Taiwan, South africa, Thailand, Belgium, France, Hong Kong, Ireland, Netherlands, Poland, Spain, Italy, Germany, Austria, Israel, Mexico, New Zealand, Singapore, Switzerland, Norway, Saudi arabia, Ukraine, United arab emirates, Qatar, Kuwait, Bahrain, Croatia, Malaysia, Chile, Colombia, Costa rica, Panama, Trinidad and tobago, Guatemala, Honduras, Jamaica.